Figure 4. Schematic representation of the hypothetical relationship among morphs of Fragilaria sensu lato published in the literature. Due to recent taxonomic changes, morphs illustrated here may be found in different varieties, species and even genera. The morphs in a (F. brevistriata) and b (F. construens) are arranged in no particular order. Each slice of the cake is designed to represent a species. 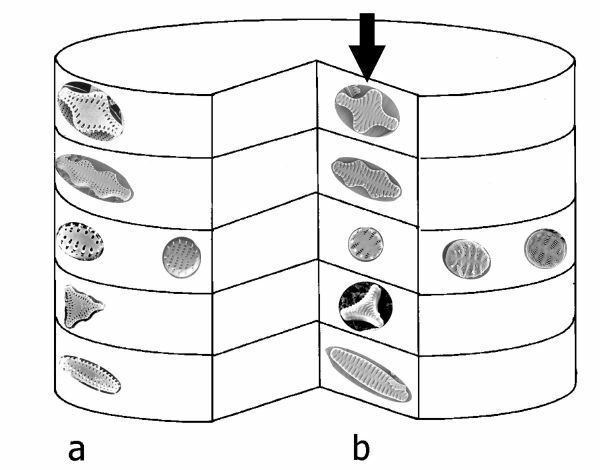 The third layer represents different elliptical morphs produced by 5 different "species." The arrow points to the morphs that could be produced by F. contruens (cruciate, biundular, elliptical, triradiate, and linear). Only the average (the most common) genotype is depicted on this slice. In reality, the slice for F. contruens should be much thicker to include all genotypes within the species, which are also able to produce the different morphs (see text and Fig. 4). All pictures in a (except second layer) after Rumrich et al. (2000). Picture in fourth layer of b, courtesy of Dr. R. Bixby.